The Galley restaurant in Ellesmere Port, based on the waterfront of the Manchester Ship Canal, they serve from home cooked food, with style and flair, as a small family run restaurant, they understand how important using local resources are and they source the freshest ingredients from local suppliers. Not only do the team at The Galley use local resources to be more sustainable, but they have now teamed up with Carbon Free Dining, the United Nations Environment endorsed dining initiative. 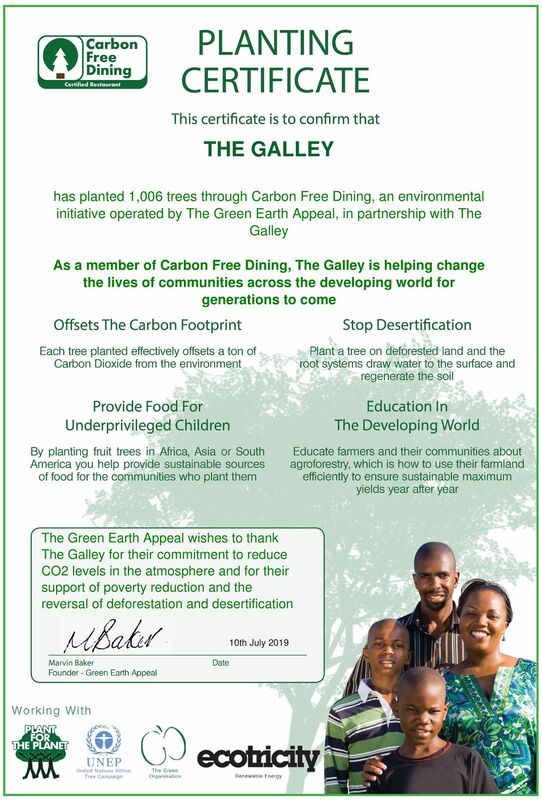 By empowering their diners to plant a life-changing fruit tree in the developing world, with each bill they present, The Galley and their diners are able to counterbalance the Carbon Footprint and food waste of each meal. Each tree planted also helps provide a sustainable way of life for entire aid-reliant communities for now and for generations to come.